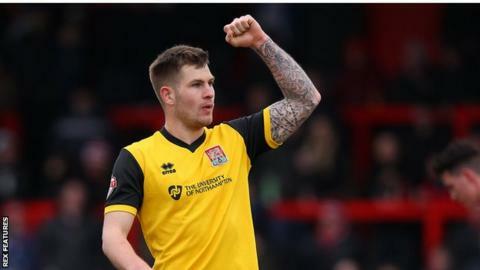 League Two leaders Northampton Town came back from 2-0 down to defeat 10-man Stevenage. Luke Wilkinson met two Dean Parrett corners to score his first two goals for Stevenage, putting them 2-0 up. A James Collins header and John-Joe O'Toole's stabbed finish either side of half-time brought the Cobblers level. Fraser Franks was sent off for pulling down Sam Hoskins before Ricky Holmes' sensational 95th-minute strike from the edge of the box won it for Northampton. Northampton are 17 points clear of fourth-placed Plymouth with just nine games left to play, while Stevenage are just seven points clear of the drop zone in 22nd position. The goal ended a turbulent week for striker Collins, who apologised after being photographed appearing to relieve himself into a glass on a racecourse balcony at the Cheltenham Festival. Stevenage caretaker manager Darren Sarll told BBC Three Counties Radio: "I think you always get what you deserve unfortunately in football. If you don't defend set-pieces properly, you don't win games. "The first one was the absolute killer in the game, at the time it was. "I've said already inexperienced players make inexperienced errors. They've not meant, they're not, they're just inexperienced." Match ends, Stevenage 2, Northampton Town 3. Second Half ends, Stevenage 2, Northampton Town 3. Substitution, Northampton Town. Jason Taylor replaces Ricky Holmes. Ricky Holmes (Northampton Town) is shown the yellow card for excessive celebration. Goal! Stevenage 2, Northampton Town 3. Ricky Holmes (Northampton Town) left footed shot from outside the box to the top left corner. Assisted by Brendon Moloney. Substitution, Stevenage. Tom Conlon replaces Greg Luer. Attempt saved. Ricky Holmes (Northampton Town) right footed shot from outside the box is saved in the top centre of the goal. Attempt missed. James Collins (Northampton Town) right footed shot from the centre of the box misses to the left. Attempt missed. Byron Harrison (Stevenage) header from very close range is close, but misses to the left following a corner. Corner, Stevenage. Conceded by Adam Smith. Attempt saved. Greg Luer (Stevenage) right footed shot from outside the box is saved in the bottom right corner. Attempt saved. Greg Luer (Stevenage) right footed shot from the centre of the box is saved in the bottom right corner. Substitution, Stevenage. Ryan Johnson replaces Ben Kennedy. Attempt missed. Ricky Holmes (Northampton Town) right footed shot from outside the box misses to the right following a set piece situation. Fraser Franks (Stevenage) is shown the red card. Sam Hoskins (Northampton Town) wins a free kick in the defensive half. Foul by Fraser Franks (Stevenage). Corner, Northampton Town. Conceded by Fraser Franks. Corner, Northampton Town. Conceded by Dean Parrett. Corner, Northampton Town. Conceded by Dale Gorman. Attempt missed. Ben Kennedy (Stevenage) header from the centre of the box is just a bit too high following a corner. Corner, Stevenage. Conceded by David Buchanan. Corner, Stevenage. Conceded by Lawson D'Ath. Corner, Stevenage. Conceded by Zander Diamond. Delay in match Byron Harrison (Stevenage) because of an injury. Luke Prosser (Northampton Town) wins a free kick on the left wing. Foul by Byron Harrison (Stevenage). Joel Byrom (Northampton Town) is shown the yellow card for a bad foul. Foul by Joel Byrom (Northampton Town). Substitution, Northampton Town. Lawson D'Ath replaces Nicky Adams. Corner, Northampton Town. Conceded by Ben Kennedy. Foul by Lee Cox (Stevenage). Substitution, Northampton Town. Sam Hoskins replaces John Marquis. Goal! Stevenage 2, Northampton Town 2. John-Joe O'Toole (Northampton Town) left footed shot from very close range to the top left corner. Assisted by Joel Byrom with a cross following a corner.